I love accessories. I'm a bling whore, from headbands to keychains, rings and necklaces, as long as it's shiny, I love it. Madelynn is all girl (or all diva, whichever you choose), and she also loves anything that shines, sparkles, and glints in the light. 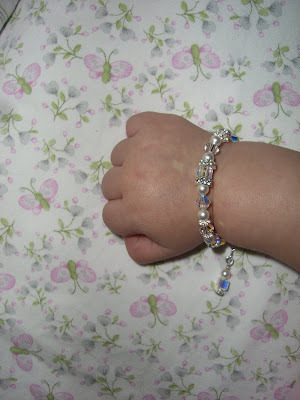 So I had to buy my little princess a bracelet, but I just could not fathom paying fifty to a hundred bucks for a three inch sterling silver, swarovski crystal, whatever else they put on it, bracelet. It's only going to fit her for like two months! I entertained the idea of just making my own, but the plastic nursing necklace was about the extent of my bling making skills, and I just couldn't make her wear something so, so preschool. This whole bracelet thing just oozes cute, so much cute that I would gag if it weren't my own baby looking so cute. So if you're looking for a baby bracelet, but you can't afford to spend a weeks worth of tip money on it (or your boyfriend is too cheap), go here and you'll find a billion different bracelets by Trendy Tatters. It's all sterling silver and she even makes custom designs. I love etsy.com. I can't believe I had never heard of it before, but this is like the third thing I've bought from that damn site. I even bookmarked the necklace that I wanted for my birthday so all Jeffrey had to do was put in his card number (romantic, I know), and I absolutely love my "Madelynn" necklace.